Bell & Gossett’s hydronic balancing solutions give you the perfect balance of adjustability and efficiency. Optimized system efficiency reduces energy and operating costs while increasing comfort. Field adjustability for precise control when and where you need it. 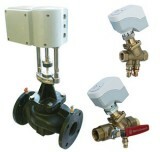 Control flows independent of fluctuating system pressures (pressure independent valves only). Broad product range and sizes ( ½” – 20″) provide a solution to fit any system needs.